Njoku acknowledged there will be more competition for targets with Odell Beckham joining the Browns, Nate Ulrich of the Akron Beacon Journal reports. "It's competition," Njoku said Wednesday. "Whoever's open gets the ball. We're a team, so we've got to see it as such. But at the at end of the day, we've got to compete." Njoku caught three of seven targets for 62 yards in Sunday's 26-24 finale loss to the Ravens. Analysis: Njoku finishes the 2018 season with 56 receptions for 639 yards to go along with four touchdowns. While those numbers are an improvement from his rookie season, the Miami Hurricane product dealt with inconsistency through much of the season and never was the red-zone threat many expected him to be. With that being said, he still possesses the talent to be a top-tier tight end in the league, and an entire offseason to work with Baker Mayfield should strengthen the duo's rapport. Njoku (knee) turned in a full practice Thursday, Mary Kay Cabot of The Cleveland Plain Dealer reports. Analysis: The unrestricted practice clears the way for Njoku to play in Sunday's season finale against the Ravens. 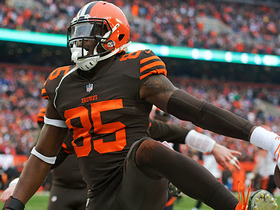 In the Browns' previous matchup with Baltimore in Week 5, Njoku drew double-digit targets for one of two times all season, parlaying his 10 looks into six receptions for 69 yards. Njoku (knee) was a limited practice participant Wednesday, Mary Kay Cabot of The Cleveland Plain Dealer reports. Analysis: Njoku has been playing through the same knee injury for weeks, typically upgrading to full participation Thursdays or Fridays. A Week 17 matchup in Baltimore won't be easy for Baker Mayfield and the Browns offense, but the Ravens haven't done a great job against tight ends, allowing 60 yards per game and 8.3 yards per target. By comparison, they've limited wide receivers to 6.4 YPT and running backs to 4.2. Njoku caught three of four targets, compiling 73 receiving yards during Sunday's 26-18 win against the Bengals. Njoku (knee/thigh) practiced fully Thursday, Scott Petrak of the Elyria Chronicle-Telegram reports. Analysis: Njoku is thus in line to play Sunday against the Bengals. The 2017 first-rounder has caught three passes in each of his last three outings, but his last notable fantasy outing came against Cincinnati in the game before that, when Njoku hauled in all five of his targets for 63 yards and a TD. Njoku (knee/thigh) was a limited practice participant Wednesday, Mary Kay Cabot of The Cleveland Plain Dealer reports. Analysis: A fixture on the injury report this season, Njoku hasn't actually come close to missing a game. After landing between four and six targets each of the past four games, he draws a Week 16 matchup with a soft Bengals defense that has allowed tight ends to catch 73 of 97 passes for 839 yards (8.6 yards per target) and eight touchdowns. An upgrade to full practice participation Thursday and/or Friday would answer any questions about Njoku's status. Njoku caught three passes (five targets) for 30 yards in Sunday's 17-16 win over the Broncos. 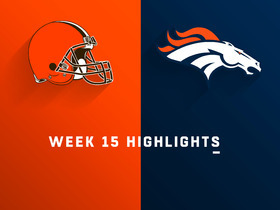 Analysis: Njoku's streak of disappointing games continued against the Broncos with yet another subpar performance. The tight end has produced 35 or fewer receiving yards in four of his last five contests, as his rapport with quarterback Baker Mayfield has been anything but reliable. He'll look to get back on track against a favorable matchup in the Bengals on Sunday. Njoku caught three of four targets for 35 yards in Sunday's 26-20 win over the Panthers. Analysis: Njoku turned in another disappointing effort despite facing a Carolina defense that's been generous to tight ends this season. The second-year man out of Miami has faded when it matters most for fantasy owners, recording 35 yards or fewer in three of the past four games. Njoku (knee) practiced fully Friday and doesn't carry an injury designation into Sunday's game against the Panthers, Nate Ulrich of the Akron Beacon Journal reports. Analysis: Since he was able to practice in limited fashion on back-to-back days to open the Browns' Week 14 preparations, Njoku never seemed in major jeopardy of missing game action. Njoku's fantasy value peaked when he earned double-digit targets in both Weeks 5 and 6, but he's earned no more than six looks in any of the Browns' subsequent six contests. Njoku (knee) was limited at practice Wednesday, Mary Kay Cabot of The Cleveland Plain Dealer reports. Analysis: Njoku, who caught three of six targets for eight yards in the Week 13 loss to the Texans, has been up and down over his last six outings. With the knee issue not viewed as much of a concern, Njoku's chances of a bouncing back this weekend are supported by the fact that Sunday's opponent, the Panthers, have had trouble limiting tight ends this season. Njoku was held to three catches for eight yards on six targets in Sunday's 29-13 loss to Houston. Njoku (knee) doesn't carry an injury designation into Sunday's game against the Texans after practicing fully Friday. Analysis: Njoku has been a hit-or-miss fantasy option of late, but he is coming off a solid effort in the Week 12 win over the Bengals, during which he hauled in all five of his targets for 63 yards and a touchdown. The Texans are riding an eight-game winning streak, but working in Njoku's favor is that Houston has had a hard time stopping opposing tight ends over its last three outings. Njoku (knee) was a limited participant in Thursday's practice. Njoku (knee) was a limited participant in Wednesday's practice, Mary Kay Cabot of The Cleveland Plain Dealer reports. Njoku (knee) caught all five of his targets for 63 yards and a touchdown in Sunday's 35-20 win over the Bengals. Njoku (knee) is listed as active for Sunday's game against the Bengals. Analysis: Njoku has been a hit-or-miss fantasy option of late, but he's a bounce-back candidate in Week 12 versus a Cincinnati defense that overall hasn't had great success containing tight ends. Njoku (knee) is listed as questionable for Sunday's game against the Bengals, Scott Petrak of the Elyria Chronicle-Telegram reports. Njoku (knee) was limited at practice Wednesday, Nate Ulrich of the Akron Beacon Journal reports. Analysis: Following the Browns' bye week, Njoku is no longer nursing a rib injury, but he continues to manage a knee issue that hasn't caused him to miss any games. Njoku has cooled off of late, but he's a bounce-back candidate in Week 12 versus a Cincinnati defense that tight ends have found a degree of success against this season. Njoku (knee/ribs) caught his lone target for 18 yards in Sunday's 28-16 win over the Falcons. Analysis: While the tight end was clearly limited by his injuries, his team still managed to pull out a surprising win, much to the delight of the home crowd. Njoku will get a much-needed opportunity to heal with Cleveland on bye in Week 11. Njoku (knee/ribs) is active Sunday against the Falcons. Analysis: Njoku was a limited participant in practice all week due to multiple injuries, but the expectation was that he'd suit up. The Cleveland inactive list will confirm that, lining up Njoku to take on an Atlanta defense that has given up just three touchdowns to opposing tight ends on the year. Njoku (knee/ribs) is listed as questionable for Sunday's game against the Falcons but is expected to play, Adam Schefter of ESPN reports. Analysis: The two injuries limited Njoku's participation in practice throughout the week, but he should be good to go versus Atlanta if he makes it through pregame warmups without incident. Confirmation on Njoku's status should come Sunday around 11:30 a.m. EST, when the Browns are expected to release their inactive list approximately 90 minutes before kickoff. Njoku (knee/ribs) is listed as questionable for Sunday's game against the Falcons after practicing in a limited fashion all week. Analysis: That Njoku practiced all week -- albeit in a limited capacity -- bodes well for his chances of suiting up Sunday. That said, those inclined to use him in Week 10 fantasy lineups will want to verify his status as the Browns' 1:00 PM ET kickoff approaches. If active, Njoku would be in line to remain a key cog in the Browns' Week 10 passing attack, after hauling in four of his five targets for 53 yards in the team's 37-21 loss to the Chiefs in Week 9. Njoku (knee/ribs) remained limited at Thursday's practice, Nate Ulrich of the Akron Beacon Journal reports. Analysis: We'll have to see if the Browns list Njoku as questionable for Sunday's game against the Falcons, or if he approaches that game without an injury designation. If he is able to suit up, the tight end should remain a key cog in the Cleveland offense in Week 10, on the heels of catching four of his five targets for 53 yards in last weekend's 37-21 loss to the Chiefs. Njoku (knee/ribs) was a limited participant at Wednesday's practice. Analysis: This marks the third straight week Njoku has been limited on a Wednesday, but he's yet to miss a game or see his snaps reduced. Any form of participation Thursday would keep him on track to play in Sunday's game against Atlanta. Njoku secured four of five targets for 53 yards during Sunday's 37-21 loss to the Chiefs. Njoku (knee) doesn't carry an injury designation into Sunday's game against the Chiefs. Analysis: Njoku followed limited practice sessions Wednesday and Thursday with a full one Friday, which allowed him to avoid a questionable tag heading into the weekend. The tight end draws a favorable matchup against a weak Chiefs secondary, which should aid his chances of bouncing back from an out-of-nowhere zero-target outing against Pittsburgh in Week 8. Njoku wasn't targeted in Sunday's 33-18 loss to the Steelers. Njoku (knee) does not carry an injury designation for Sunday's game against the Steelers. Analysis: The knee issue that limited Njoku at practice earlier this week won't be enough to keep the tight end from handling his duties this weekend. Njoku has scored in his last two games and has clearly emerged as one of QB Baker Mayfield's preferred options in the Cleveland passing game. Over his last three outings, Njoku has combined for 17 catches (on 29 targets) for 176 yards and two scores. Njoku was a limited practice participant Wednesday due to a knee injury, Mary Kay Cabot of The Cleveland Plain Dealer reports. Analysis: The second-year tight end apparently picked up the injury while catching four of six targets for 52 yards and a touchdown in Sunday's 26-23 overtime loss to Tampa Bay. His ability to practice in any capacity Wednesday is a good sign for his availability Week 8 against the Steelers. Njoku and Jarvis Landry have been doing the heavy lifting for Cleveland's passing game of late, with the former racking up 228 receiving yards and two touchdowns on 22 catches over the past four weeks. Njoku collected four of six targets, accumulating 52 receiving yards and a touchdown during Sunday's 26-23 overtime loss to Tampa Bay. Njoku caught seven passes (12 targets) for 55 yards and a touchdown during Sunday's 38-14 loss to the Chargers. Analysis: Njoku was able to find the end zone for the first time in 2018 when he went up and caught an underthrown ball on a fade route from Baker Mayfield in the fourth quarter of Sunday's game. This could be a sign of big things to come for the second-year tight end, as not only did Mayfield target him in the red zone again, but his 22 targets over the past two games leads the team. Njoku and Mayfield will look to continue their rapport next Sunday against Tampa Bay. Njoku caught six of 11 targets for 69 yards during Sunday's 12-9 overtime win against the Ravens. Analysis: Njoku's team-high 11 targets also marked a career high for the second-year tight end, as quarterback Baker Mayfield constantly looked his way Sunday. Njoku's increase in targets could lead to more touchdowns, as Njoku has yet score this season after finding the end zone four times as a rookie in limited playing time in 2017. The second-year pro will look to continue his rapport with Mayfield next Sunday against the Chargers. Njoku caught five of seven targets for 52 yards during Sunday's 45-42 loss to the Raiders. Analysis: It's no surprise Njoku had his best game of the season during Baker Mayfield's first career start. Mayfield is capable of opening up the passing game significantly more than Tyrod Taylor (back), and that clearly aided Njoku, who posted season highs in receptions and yards. 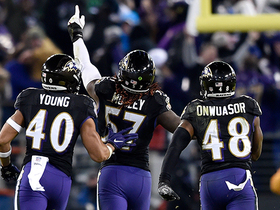 The second-year tight end will look to keep it going Sunday against the Ravens. Njoku caught both of his targets for 36 yards during Thursday's 21-17 victory over the Jets. Analysis: Both of Njoku's receptions came from Baker Mayfield, though with just one catch in the second half, he wasn't as involved in the offense as fantasy owners would have liked. However, if Mayfield is in fact the starting quarterback moving forward, his gun-slinging ways and ability to throw the ball downfield should help Njoku's value, and the tight end could very well see a considerable uptick in targets. Njoku hauled in four of seven targets for 20 yards in Sunday's 21-18 loss to the Saints. Analysis: Njoku was targeted seven times for the second consecutive week, though the tight end again failed to do much with his plethora of looks. His longest catch went for eight yards and he seems to be just a short-yardage option, despite his athletic ability to get down the field. More targets could be coming Njoku's way to make up for Josh Gordon's (hamstring) absence. Njoku played 78 of 89 snaps (87.7 percent) in Sunday's 21-21 tie with Pittsburgh, catching three of seven targets for 13 yards. 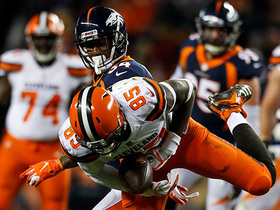 Njoku departed Sunday's game against the Steelers in the third quarter with an undisclosed injury, Tom Withers of the Associated Press reports. Analysis: It's unclear what's afflicting Njoku, but he was at least able to walk off the field under his own power. 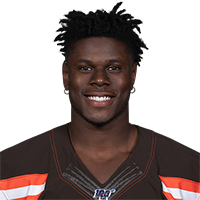 The Browns should provide an update on Njoku's condition after the game if he fails to check back into the contest for the team's subsequent offensive drives. Njoku (ankle) was back at practice Sunday after missing Saturday's session, Mary Kay Cabot of The Cleveland Plain Dealer reports. Njoku hauled in all four of his targets for 25 yards during Thursday's preseason 5-0 win over the Eagles. Analysis: Njoku was able to get back into the box score after being held without a reception in the team's second preseason game last week. The second-year tight end has shown good chemistry with both Tyrod Taylor (wrist) and Baker Mayfield in training camp and preseason game action, and there should be little that holds him back from breaking out in 2018, especially if he secures an every-down role. Njoku was unable to corral his lone target in Friday's preseason game against Buffalo. Njoku caught two of his three targets for 46 yards and a pair of touchdowns in Thursday's 20-10 win over the Giants to open the preseason. 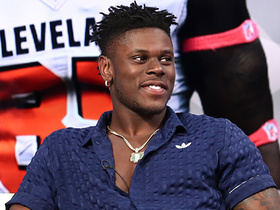 Analysis: There have been rumors of Njoku struggling with drops in camp, but he had no problem holding on to a 36-yard touchdown pass from Tyrod Taylor on Cleveland's second possession. The athletic tight end found the end zone again two possessions later, this time on a 10-yard pass from Baker Mayfield. Njoku's prospective fantasy owners have to be ecstatic with this performance, especially since he showed a rapport with both of the team's potential starters at quarterback. Njoku continues to struggle with drops early on during training camp, Scott Petrak of the Elyria Chronicle-Telegram reports. Njoku dropped four passes during Sunday's practice, Mary Kay Cabot of The Cleveland Plain Dealer reports. The Browns are expected to transition second-year tight end Njoku into a full-time starting role this season, Nate Ulrich of the Akron Beacon Journal reports. Njoku, who caught two passes for 38 yards during Sunday's 28-24 loss to the Steelers, finishes his rookie season with 32 catches for 386 yards and four touchdowns. Analysis: Njoku and fellow tight end Seth DeValve spent much of the year splitting offensive snaps, yet Njoku showed numerous flashes that he is capable of being Cleveland's No. 1 tight end in 2018. He led the team with four touchdowns and was just one reception shy of tying for the second most. The rookie has a bright future, and his outlook will only improve if the Browns improve their offense this offseason. Njoku was held without a catch on three targets during Sunday's 27-10 loss to the Ravens. Analysis: For the first time in his NFL career, Njoku finished a game without at least one reception, ending a remarkable streak of 13 consecutive matchups with a catch. The rookie tight end out of Miami has been quiet during the last two weeks, with just one reception on five targets. Josh Gordon's presence has eaten into Njoku's targets, but because Cleveland is usually playing from behind, there still should be plenty of opportunities for the 21-year-old to finish the season strong. Njoku (foot/wrist) practiced fully Friday and doesn't carry an injury designation for Sunday's game against the Ravens. Analysis: Neither injury looks like it will inhibit Njoku in Week 15, but his inconsistent production in recent games will make him a high-variance fantasy play at tight end. After turning in back-to-back four-catch outings in Weeks 12 and 13, Njoku failed to make an impact in the Browns' loss to the Packers last Sunday, hauling in just one of two targets for three yards. Njoku was limited at practice Wednesday with foot and wrist injuries, Nate Ulrich of the Akron Beacon Journal reports. Njoku finished with one reception (two targets) for three yards during Sunday's 27-21 overtime loss to the Packers. Analysis: Coming off a career game in Week 13, the rookie tight end earned nine more offensive snaps than Seth DeValve, though his stat sheet failed to reflect that. DeShone Kizer failed to involve Njoku in the offense, as most of his time was spent slinging the ball to Josh Gordon and Corey Coleman. Njoku has put together an impressive rookie campaign with four touchdowns, but until he gets more involved in the offense, his value as a fantasy player has its limits. Njoku caught four of six targets for 74 yards and a touchdown during Sunday's 19-10 loss to the Chargers. Analysis: A week after bringing in a career-high four catches, the rookie tight end duplicated that and set a new career high in receiving yards. Njoku also ended his six-week touchdown drought when he caught his fourth score of the season -- the most ever for a Browns' rookie tight end. He'll look to continue his hot streak next week versus the Packers. Njoku caught all four of his targets for 47 yards during Sunday's 30-16 loss to the Bengals. Analysis: After three disappointing weeks in a row, Njoku broke out, in a way, and finished with the most receptions in a game during his short career. His 47 receiving yards trumped his total from the past three games combined, as the rookie tight end and DeShone Kizer were on the same page against Cincinnati's defense. The 21-year-old still hasn't scored since Week 5, but this game only bodes well for his usage and opportunities going forward. Njoku played just 21 of the team's 55 offensive snaps and finished with one catch (one target) for 13 yards during Sunday's 19-7 loss to the Jaguars. Analysis: Over Njoku's last two games, the rookie tight end has only been able to haul in two catches for 16 yards, as Seth DeValve continues to get most of the playing time in coach Hue Jackson's offense. Njoku's one target Sunday was his lowest total of the season, and he hasn't been able to find the end zone since Oct. 8. The 21-year-old has 20 receptions for 211 yards and three touchdowns this season. Njoku grabbed just one of his six targets for three yards during Sunday's 38-24 loss to the Lions. Analysis: While Njoku and Seth DeValve each earned six targets apiece, it was DeValve -- not the rookie -- who made the biggest impact. DeValve finished with four receptions for 70 yards to Njoku's one catch. Sunday wasn't a complete letdown for the 21-year-old, though. For the first time in weeks, he out-snapped DeValve, as he may finally be ready to take on a bigger role in Cleveland's offense. 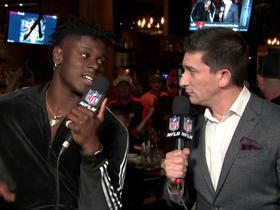 Cleveland Browns tight end David Njoku joins "Free Agency Frenzy Live" and discusses the Cleveland Browns recent Free Agency moves and his expectations for next season. 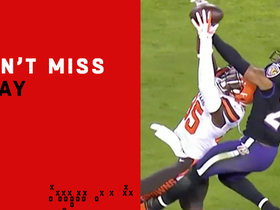 The Baltimore Ravens' defense blitzes, almost forces Baker Mayfield interception. 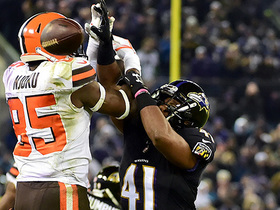 Baltimore Ravens defensive back Anthony Levine breaks up Baker Mayfied pass attempt to tight end David Njoku on first down. 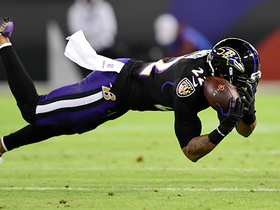 Baltimore Ravens cornerback Jimmy Smith picks off tipped Baker Mayfield pass. 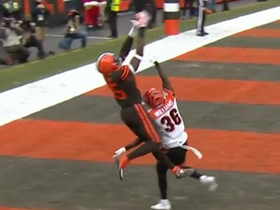 Cleveland Browns tight end David Njoku uses one hand to haul in this fourth-down pass.